Irvin and his wife of 69 years, Cora, shared this decision with their daughter, Pat, several times during the last months of their lives. Irvin and Cora’s love story began like many others. 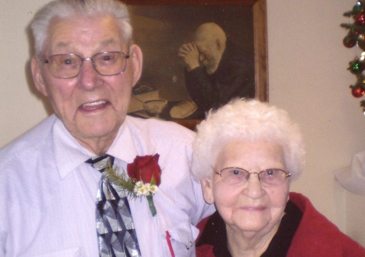 After meeting on a double date, they married on December 20, 1941 in Halstad, Minnesota. Together they raised two children, daughter Pat and son Jerry. In July 2010, Cora was hospitalized for a heart condition. Her physician was very direct, telling the family Cora’s condition was irreversible. “While we somewhat expected to hear our 95-year old mother was in a fragile state, hearing she had two months to live was a shock,” recalls Pat. The physician recommended hospice care. Cora began receiving care from Hospice of the Red River Valley. At the time, Cora and Irvin were living at a long-term care facility in West Fargo. The family was pleased to learn another move would not be necessary, and that Hospice provided care right where Cora and Irvin called home. Pat fondly recalls the attentive care her mother received during her months on Hospice care. Irvin, in fact, was so pleased with the care Cora received from volunteers, CNAs, social workers, chaplain and nurse; he asked if he might receive the same attention. Initially, Irvin didn’t meet the medical guidelines for Hospice services, despite his age of 96. However, two months later a second evaluation confirmed his medical conditions made him eligible. Despite her original prognosis, Cora surpassed her physician’s expectations. “Even after eight months, there was no change in how Hospice caregivers responded to her needs,” Pat says. Even during the chaotic final weeks of their lives, Pat cherished that her parents’ continuum of care was never compromised, even when Cora’s condition required a higher level of care with a nurse at the bedside 24 hours a day. The last chapter of Irvin and Cora’s 69-year love story closed on April 10, when Cora passed away with Irvin’s hand on hers. Irvin closed his eyes as Cora took her last breath. “Dad did not respond when we told him Mom had passed. He never reopened his eyes, nor did he say another word,” Pat remembers. Irvin died just six days after his beloved wife, on April 16. As a way to commemorate their relationship, the family decided on a joint obituary and funeral for both Cora and Irvin. “After all, they did basically leave this earth together,” Pat explains. With the help of Hospice, Cora and Irvin’s end-of-life journey allowed them to maintain their dignity in a peaceful and comfortable manner, never compromising their close relationship.